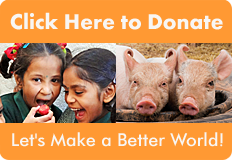 During the holiday gift-giving season, a popular choice for gift-donations are programs that send live farm animals as “gifts” to help alleviate hunger and poverty in low-income countries. Our purpose here is to make the criticisms of these campaigns public and to encourage alternatives that are more effective and more compassionate. 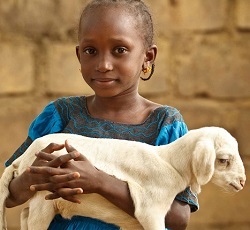 We examine the flaws in concept and practice with animal-gifting groups in general, which include organizations such as OxFam, World Vision, Heifer International, Samaritan’s Purse, Christian Aid, Adra International, and many more. In short, we explain why animal gifting doesn’t necessarily help, and sometimes harms, the recipients, and how these programs may be misleading to donors. Increased dairy production is frequently touted as one of the greatest successes of animal gifting programs. 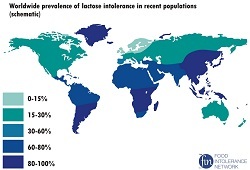 However, 75% of the world is lactose-intolerant, and 90% of Asian and African populations (toward whom dairy programs are aggressively targeted) are lactose intolerant. As such, both small- and large-scale dairy programs negatively affect the health, well-being, and productivity of people in lactose intolerant populations. Additionally, dairy production negatively impacts local communities with ripple effect consequences that ultimately disadvantage entire societies. Lactose intolerance occurs when there is not enough of an enzyme called lactase. Because of this, raw milk still poses problems. The result is widespread digestive ills such as stomach pain, gas, bloating, cramps, diarrhea, and even vomiting. Consuming milk from other animals is also associated with allergies, asthma, and a host of autoimmune disorders. 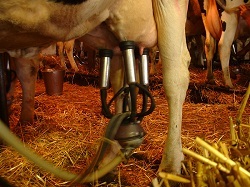 Most mammals (including humans) become lactose intolerant after weaning. Milk is very specifically created for infants of ones own species, not adults of any species. There is also no need for humans to consume the milk of other animals. Logically, this makes sense, but rarely is it fully considered. While dairy is “a” source of calories and protein, the resources used to produce it may be better spent on alternatives that provide a higher quality and quantity of calories, protein and calcium. Animal-giving programs seem to focus on small-scale farming, but they have extremely large-scale implications that pave the way for factory farming and exponentially increase consumption of meat, dairy and eggs throughout entire countries and beyond. Heifer International is largely considered responsible for kick-off of industrialized dairy in Japan after World War II. 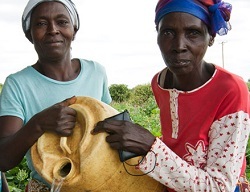 Heifer International boasts that their projects produced 3.6 million gallons of milk in one year in Uganda and developed a national dairy program in Tanzania. These massive programs were developed despite the high prevalence of lactose intolerance in these regions (more than 90% of the population in some Asian and African countries) and despite the fact that native plant crops are capable of producing equal or greater amounts of protein, calcium and other nutrients. Pro-meat biases mean that sustainable plant crops that actually provide better nutrition and more income are often overlooked. 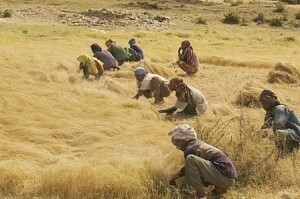 Teff, for example, is one of Ethiopia’s oldest grains. It is drought and heat tolerant, while also being packed with protein and calcium. “In Ethiopia, over 40 percent of the population is considered hungry or starving, yet the country has 50 million cattle (one of the largest herds in the world), as well as almost 50 million sheep and goats, and 35 million chickens, unnecessarily consuming the food, land and water… [P]oorly managed cattle grazing has caused severe overgrazing, deforestation, and then subsequent erosion and eventual desertification. 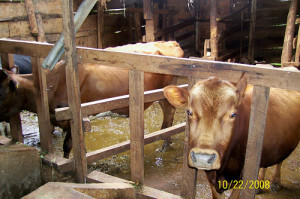 Much of their resource use must be focused on these cattle. Instead of using their food, water, topsoil, and massive amounts of land and energy to raise livestock, Ethiopia, for instance, could grow teff, an ancient and quite nutritious grain grown in that country for the past 20,000 to 30,000 years. Teff…is high in protein, with an excellent amino acid profile, is high in fiber and calcium, (1 cup of teff provides more calcium than a cup of milk), and is a rich source of boron, copper, phosphorus, zinc, and iron. Seventy percent of all Ethiopia’s cattle are raised pastorally in the highlands of their country, where less than 100 pounds of meat and a few gallons of milk are produced per acre of land used. Animals do not magically produce milk and meat or just “live off the land” by grazing (details below). 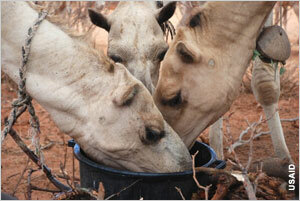 Animals must be provided food and water in areas where these resources are already scarce. Having another mouth to feed can significantly add to a family’s burden, and the animals frequently suffer from neglect, malnutrition, dehydration, lack of veterinary care, and lack of shelter from temperature extremes. Photo: creative commons flickr user treesftf. While tempting to believe, farmed animals do not just “live off the land” consuming only grass and scraps that don’t compete with human consumption. In response to criticism that promoting animal agriculture in regions already plagued by desertification and drought is irresponsible, several animal gifting organizations now have “zero-grazing” requirements. Unfortunately, zero-grazing means that confined animals must actually have food and water brought to them. This food and water can be in direct competition with human consumption. Zero-grazing is not only bad for the animals who are confined, it is also bad for the people (often times bad for children) who must use their time, labor and resources to bring food and water to the animals. Raising animals requires up to 10 times more water than growing crops for direct consumption. Yet, organizations such as Heifer International promote inherently water-intensive animal farming, even in areas identified as water-scarce. This means that already limited freshwater supplies are diverted to animals for their hydration, sanitation, and the cultivation of the forage used to feed them. 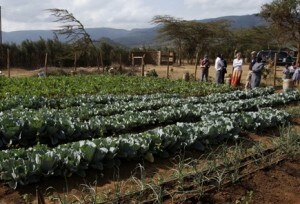 These uses of water are in direct competition with the drinking water needs of local communities, as well as with the supply of water available to grow foods for direct human consumption. Additionally, in many arid communities, water is only available from a communal well or reservoir, in which case hydrating animals is a labor-intensive process for adults and children who must travel by foot and can only carry so much. 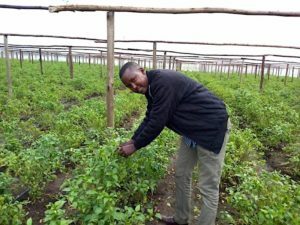 Initiatives such as micro-irrigation (or drip irrigation) projects for growing crops are far more sustainable and ecologically sound, and have helped provide an alternative livelihood to many pastoralists and subsistence farmers. With micro-irrigation, crops can be grown year round, supplying families with sources of food as well as income from surplus harvest. Families who have lost farmed animals to drought are now growing crops and experiencing food security, better nutrition, and access to healthcare and education as a result of a steady income. Liconsa is a federal program that distributes milk to disadvantaged populations in Mexico. One effect of Western food aid programs that focus on increasing meat and dairy production and consumption is the erasure of more nutritionally appropriate and culturally relevant indigenous foods. Our guest posts by contributor Nassim Nobari explore the cultural, economic and health implications of distributing milk and other dairy products as food aid in communities where dairy is not traditionally consumed. As we have noted elsewhere, many animal gifting organizations aggressively promote dairy consumption and production in countries where much of the population is lactose intolerant, and despite the fact that native plant crops are capable of producing equal or greater amounts of protein, calcium and other nutrients. The state of Chiapas gets its name from the chia seed, a calcium powerhouse. 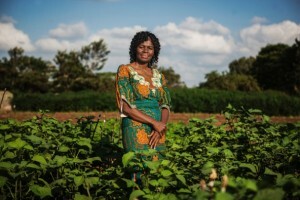 Early in her childhood, Mary Abukutsa-Onyango developed an allergy to meat, dairy, and eggs, and a doctor advised her to avoid eating any animal products. 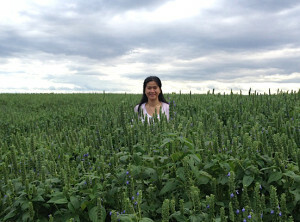 Her mother and grandmothers raised her on nourishing meals made from native plants growing around her village, which sparked an early interest in horticulture and plant-based nutrition. She continues to consume a plant-based diet and to promote the importance of indigenous crops for improved health and food security. Read more about her work here. Similarly, across sub-Saharan Africa, more than 2,000 native grains, legumes, roots, vegetables, cereals, fruits and other food crops have been used to nourish people for thousands of years. But since the 1960s, with Western models for increasing food yields dominating the global landscape, agriculture has primarily focused on intensification of livestock production, and cultivation of staple food crops such as rice, wheat and maize, often to the neglect of valuable native wild edibles. 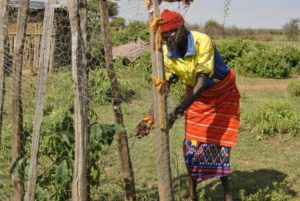 In response, the Samburu tribe, working with Sadhana Forest, has embarked on an initiative to plant 18 species of indigenous drought-resistant fruit trees and shrubs. These food-bearing trees are rich in nutrients and, in addition to increasing food security, improve soil quality and water absorption rates, making desertified earth better suited to growing plant food crops. Former Indian minister for social welfare and animal protection, Maneka Gandhi explains that when goats are allowed or forced by consequences to graze: “each goat eats all the grass and shrubbery on two hectares of land a year. 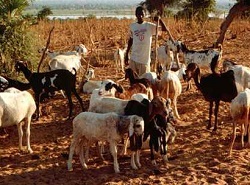 A goat destroys the fertility of land and [the value of] any milk or dung it may give is very little compared to the havoc it wreaks……within two years, the people who get goats have an even poorer lifestyle. Animal gifting organizations spend exorbitant amounts of money on colorful, glossy catalogs depicting cute children hugging and kissing healthy, happy animals (like this HI photo). From these catalogs, donors choose which animal they would like to send as their gift-donation. Vegetarians and vegans beware: bee and tree gift-donations can support any animal program, fundraising, or overhead. 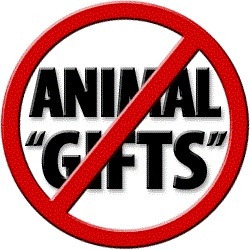 Furthermore, children who are supposed to benefit from animal gifts may be taken out of school to tend to animals. Some children have even had to sleep in the barn with animals to prevent theft. Ultimately, most of their animal “friends” will suffer painful deaths due to disease, deprivation, or slaughter. And finally, the animals are far from happy. Many gifted animals suffer from confinement, neglect, malnutrition, and lack of protection from weather and temperature extremes. 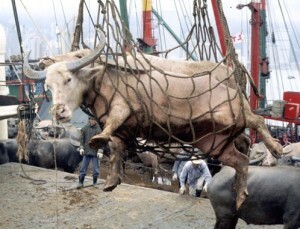 Animals also endure horrific slaughter processes and long distance transport to and from the recipient’s location. *Note: slaughter photo not shown due to graphic nature. GiveWell charity rating organization deemed in their evaluation of Heifer International that the organization lacked sufficient transparency and priority programming to secure GiveWell recommendations or funding. “When examining organizations implementing livestock-distribution programs, we feel it is appropriate to ask the following questions. We have not found a livestock-distribution charity that has published either evidence of impact… or clear answers to these questions. Are the livestock in good health? Will they meet recipients’ expectations, or will they die or underproduce, potentially causing people to make bad plans and investments? Do the recipients of livestock intend to take care of the livestock well? Or is there reason to be concerned that gifts of livestock could lead to cruelty to animals? Are gifts successfully targeting those in need within a community? Is there a risk of fostering jealousy and/or economic instability? Are there other consequences of introducing large numbers of livestock into a community? Due to popular demand, we created a special Plants-4-Hunger gift-giving program to provide a compassionate and highly effective alternative. We send 100% of your donation to four hand-picked groups with low overhead and proven successes in high-need areas. These hunger relief projects provide both immediate assistance and long-term community solutions that feed some of the world’s most deprived children without harming animals. We make it easy with one tax-letter, personalize gift-card and our inspiring information booklet, but you may also choose to give directly to these groups or choose from our grants list.